Current Status: in Grand Lodge vault; formed by merger of St. Paul's and Algonquin Lodges, 03/08/1988; merged with Delta Lodge, 10/24/2014. Hesperia Lodge merged here, 06/24/2004. Saint Paul's Lodge of Braintree and Algonquin Lodge of Quincy were officially merged into Saint Paul's-Algonquin Lodge of Braintree when Grand Master Albert T. Ames and Grand Lodge officers met at Braintree on May 28. The Lodge will meet in the Braintree Temple, off Washington St., the second Thursday of the month. Wor. Joseph H. Hilchey was seated the first Master. 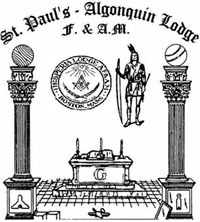 Saint Paul's Lodge was chartered 1846 and Algonquin dates its precedence to 1913 in Dorchester. The merger reduces the Lodges in the South Boston Fourth District to four. This page was last modified on 1 May 2018, at 10:41.